Animal RIddle. Why Crowd One Feeder? Animals fascinate me, almost every day. 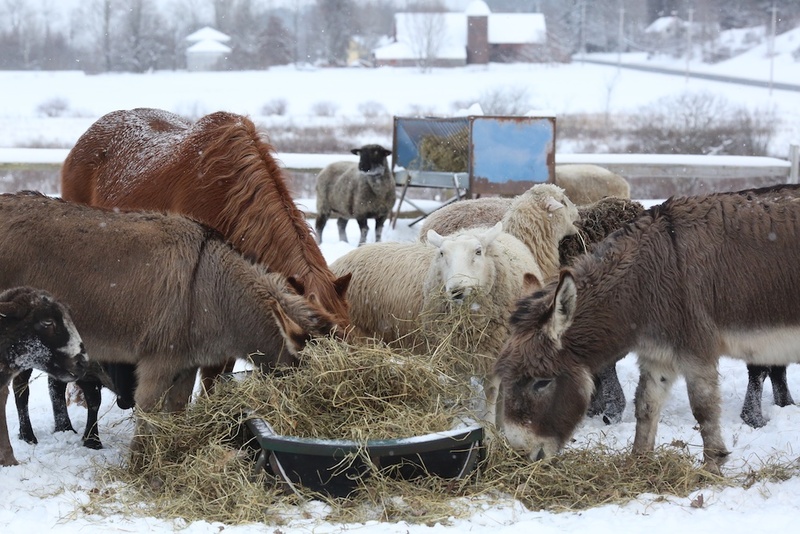 I have noticed after a storm that animals all tend to gather at the same feeder, even though they normally eat at separate feeders – the equines at one, the sheep at another. Today, as always happens after a storm, everyone but one (Griselle, I think) is at one crowded feeder, while one wily sheep is chowing done on the same good second cut hay in the rear. Why? I have no idea. Animals have their own signals and instincts and habits, and most of them are utterly beyond the comprehension of human beings. On the surface, it makes no sense for animals to jam together like that, crowding each other for hay when there is an open feeder a few feet away. And why only after nasty storms? What signals do they give or get? What instincts are pushing them that way. I love to try and figure out animal things like this, this one has stumped me for years.